Please make sure that your co-op or social enterprise is represented at this crucial event! Everyone is welcome, but for members of SCS CIC or SDWC this will also include the Annual General Meeting. The new everyday participation toolkit is essential for any membership organisation. Deeper engagement by stakeholders + processes that generate new ideas = better social impacts. We need to go beyond the formalities of membership and use the seven modes of membership to make participation real. For details and RSVP (or to participate via video conference) please call 0300 456 2265 or email services@somerset.coop. I'm actually posting this after the event on the front cover of our newsletter has taken place - by all accounts it was a fabulous success with over sixty people present. 2pm - 4pm Middle Street (near Primark). 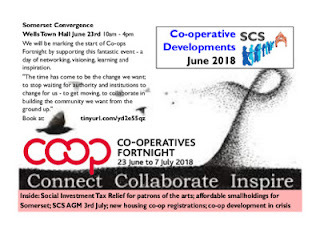 Please join us to raise awareness of co-ops in South Somerset and get some new members signed up to them! Featuring Southern Co-operative, South Somerset Community Energy and the Ecological Land Co-op. Annual General Meeting of Somerset Co-operative Services CIC (and Somerset Development Workers Co-op) featuring a workshop on Everyday Participation. Tuesday 3rd July at 10 East Reach - more to follow on this later in the week. Street stall in Taunton, Wednesday July 4th: 1pm - 4pm Fore Street (outside Next). Please join us to raise awareness of co-ops in Taunton Deane and get some new members signed up to them! Featuring Somerset Co-op CLT, Brendon Energy and Somerset Community Credit Union. You can download the whole newsletter by clicking here. A new national consortium of co-operative development workers is proposing a to pilot a wave of co-operative incubators around the UK, following a research project by SCS. They believe that the mix of affordable workspace for social entrepreneurs, linked to a local network of technical and financial support, could be an effective model for growing a new generation of community owned businesses. SCS carried out the study as part of a Bristol University programme, in order to identify the conditions for more business support aimed at enterprises that are managed democratically by employees and other stakeholders, and are run in accordance with a policy of sustainability of community development. Despite recent interest in social enterprise across the country, Co-operatives UK found in 2016 that specialised support services were in steep decline – and had been for several years. Drawing on examples from Sweden, Denmark, Spain, Sheffield and Taunton, SCS found that a key part of reversing this trend would be a new approach to business incubation. “Grant funding for social enterprise hasn’t encouraged incubators, and grant funding for incubation hasn’t benefited social enterprises. What we need now is fully financed incubators in which the tenants have a diverse range of business ideas but share co-operative values and work together in co-operative ways; supported by staff that are actively engaged in bringing together talented people with good ideas and networks of ethical investors,” said Alex Lawrie, the author of the report. The proposal is being actively investigated by The Development Co-operative, a new national consortium of co-operative development specialists. They are looking for groups and experienced individuals that are interested in starting new co-operative incubators; with a critical mass of projects, the Development Co-operative can start working with the growing number of social investors to help them get off to the best possible start. Interest from all over the UK is encouraged, and by projects at any stage of development.